A pretty, Ceramic/ China Dancing Lady Figurine. Condition is Used. There is a tiny chip ‘under’ her skirt (see photo) but when she is displayed standing it is not obvious. She stands approx 13cms high. Dispatched with Royal Mail 2nd Class. It's only backstamped " Bone China, England " So I'm not sure of the maker. The item in the pictures is the one you will receive. I am usually faster and will never be slower. The saucer is approx 14.4 cm wide. 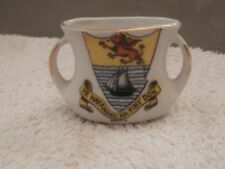 The cup is approx 6.7 cm high and 8 cm wide at the top not including the handle. The side plate is approx 16.7 cm wide. It's only backstamped " Bone China, England " So I'm not sure of the maker. Asiatic Pheasants - Small Tureen & Plate. C1870. Excellent Condition. Asiatic Pheasants - Small Tureen & Plate. Excellent Condition. 8" x 5.5". Maker unidentified. Quality Handpainted Enamel Bone China Plate Fleur De Lys 3951 Lynton Spode? 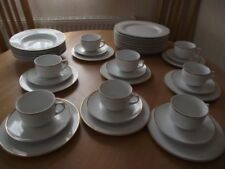 No makers marks but it feels like a Bespoke Lynton or Spode China Piece. Beautiful very high quality Dinner plate. Antique Biscuit Barrel Blue Jasper Neoclassical Dancing Ladies Scene Circa 1900. A beautiful blue jasper ware biscuit barrel wonderfully decorated with neoclassical dancing ladies, set with silver plated lid. Asiatic Pheasants - Small rectangular tureen /serving dish. Very slight crazing. Maker unidentified. We guess this is 1980s. A lovely limited edition small blue lustre glaze urn with twin handles. It stands approx 3 1/2" tall by approx 4" wide (at its widest point). Finished in blue lead lustre effect glaze on the outside and a uniform blue glaze on the inside. Blue and Gold glitter ornamental mask. In excellent condition. There is cracking of the glaze on the inside but it hasn't affected the front. The mask used to hang on a wall but for the last few years been left in a cupboard. The size is: 27 cm x 24 cm at the widest part. We are only passing on the costs associated with getting the item to you safely and in one piece. Very Good Condition. 6cm or 2 1/2" high and 20.5cm or 8" across. Rest of the World. Good size practical vase, square sides, all intact and features intricate images of peacocks. A lovely pair of blue painted ribbon plates. Woven with cream ribbons. Scalloped edging. Has gold coloured edging on and around designs. Ribbon abit discoloured but could easily be replaced. Would look lovely in any room. Google Translate struggles with the translation of "Ate Osanjos O Bebem" - depending on use of capitals it gives differing. Weighs 1.7kg. VERY QUICK DISPATCH. results from "even the elves drink it" to "Until you drink it, you drink it". Vintage Floral~ Sandwich/Cake Plate Minton Delft? This beautiful plate minton delft design. Unmarked but un amazing condition despite its age. With ornate gilt ormolu to the base and lid. A lovely quality round porcelain trinket box in beautiful cobalt blue. If you require perfect then you should consider buying reproduction. Green Jasper ware plaque of dancing hours in white relief to the centre of the lid. Floral style in cobalt blue and amber colours on a white background. Embellished with gilt. Very decorative. If you like this item you might be interested on our other china and pottery collectables. Lovely Eastern Handpainted Pottery Red & Blue Floral Design Scalloped Rim 25cm Very decorative,with traces of gilding in places. Does show a bit of damage, there's a crack, possibly a firing crack to the front,and a very small chip to the foot as shown. Please see my other items. The glaze's iridescence gives it a wonderful range of colour shades. A really beautiful and striling Art Deco style iridescent blue vase in the shape of a fan. The vase does not have a maker's mark but there is a small mark, possibly an "n", in gilt on the base. Beautiful old plate with hand painted floral decoration. Vintage Blue Stripe China Egg Cups And Salt Shaker Woods? Ironstone ? Boxes will be marked 'FRAGILE'. About Photos. No manufacturer’s backstamp and I have no idea of the date for this item. I try my best to take photos as representative, as I can, of the item being sold. Listed is one shiny shell shaped ash tray that could also be used as a nick-knacks pot. Item appears to be in good condition. I have noticed one chip to the upper rim (see photo 5). Colour is a mix of a light silver/white, golden brown and blue with shades of pink showing when item moved in certain light. Here we have a beautiful porcelain egg, by Dominie's collection from Harrod's. It features a lovely gilt and painted flower design. Grab a beautiful piece at a bargain price before they're all gone. 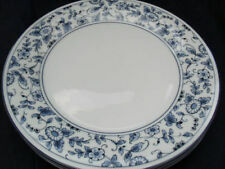 Blue and white transfer ware deep plate 45cm as per picture. Of triangular form with relief decoration. No backstamp, probably late19th/early 20th Century. Gaudy Imari. Cobalt Blue&Gilt. Pair of Trianguar Dishes. 5½" Long (5" Base to Apex). UK Wherever Possible. This is a Limoge Style Reproduction Vanity / Jewellery storage Dish. There is no Box. The Lid is removable. 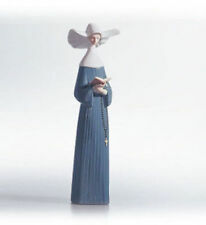 STANDS 8cm HIGH. ROYAL BLUE, GOLD AND WHITE. Very pretty china basket. It has a scalloped rim with a floral motif around the interior. The handle is gold with rope finish. The exterior is blue and white with larger flowers. Unmarked; Gilt worn, no stoppers. Very old replacement china side plate, in autumn fruits with pale blue and rust coloured pattern, finely scalloped edges with gilding. Age and manufacturer unknown (no maker's marks at all) The plate is 18.5 cm (7 1/4 inches) diameter. A beautiful unmarked footed cup and saucer - with a blue bird and flower motif and good gilding. Very nice used example of this gilt highlight, pierced rim, cake plate. Relief scroll pattern near piercing, fluted inner rim. Blue Floral & Gilt. Pierced Rim. Cake Plate. 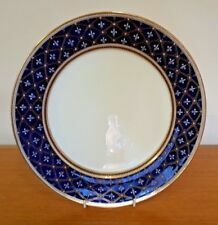 CHINA SIDE PLATE CRESTED BUXTON NO MAKER DARK BLUE RIM OVERLAID IN GOLD COLOUR.